Description: Bubu the fairy chef is especially good at making dessert! Follow her magic recipe and make delicious pudding and cupcakes for the animals! Instructions: Use your mouse to play the game! Fairies make it, carnivals sell it and children eat it. I'm talking of course about the mysterious and delicious 'fairy floss' a magical candy creation that resembles sweetened cotton. She's got a recipe stuck in her head. And all of her friends are addicted to her cooking! Did someone turn on the oven? Because there are hundreds of delicious smells coming from the kitchen! Become a Sushi Ninja! 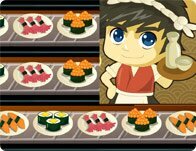 Run a cool kitchen and prepare to serve some friendly customers in this fast paced and fun sushi making game! Elsa wants to become a master chef, but she is not able to do this alone. Can you help Elsa with preparing some lovely dinner? She will be really happy!